Mac Haik Ford can show you the Safety Canopy airbag system that is designed to keep all of your passengers safe. The side-curtain airbags deploy outwards and downwards to protect the heads of any outboard passengers during a collision. To ensure that the airbags of the driver and front passenger deploy correctly, they are outfitted with roll-fold technology. 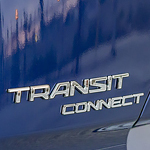 For visibility, the Ford Transit Connect comes with HID headlamps. They can be placed in Automatic Mode and will turn on whenever they detect low-light conditions. Lights will also be engaged when you turn on windshield wipers.